Definition at line 28 of file staticsimple.h. Constructs a new static simple object with the given parent. Definition at line 35 of file staticsimple.cpp. Sets a list of top-level directories beneath your 'root' directory that should always be served in static mode. Definition at line 56 of file staticsimple.cpp. Sets a list of directories in which to search for your static files. The directories will be searched in order and will return the first file found. Note that your root directory is not automatically added to the search path when you specify an include_path. Definition at line 47 of file staticsimple.cpp. Definition at line 62 of file staticsimple.cpp. 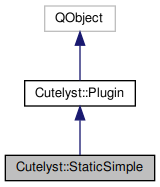 References Cutelyst::Application::beforePrepareAction(), Cutelyst::Response::headers(), Cutelyst::Context::res(), Cutelyst::Response::setBody(), Cutelyst::Headers::setContentLength(), Cutelyst::Headers::setContentType(), Cutelyst::Headers::setHeader(), Cutelyst::Headers::setLastModified(), and Cutelyst::Response::setStatus().